The same is true of our pets. The learning starts with simple concepts like touching teeth. Say “teeth”, touch a tooth, and then offer a tasty tidbit. Repeat with other teeth until the pet understands that “teeth” means “treat”! Once that concept is mastered, you can start rubbing teeth with your finger, again following with a treat. Adding a small piece of pantyhose to your finger will provide some gentle scrubbing action. In addition to removing a thin layer of plaque, brushing with your finger stimulates the gingival tissue to produce collagen fibers that make it tough and resilient. 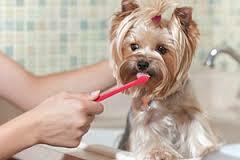 Over time, introduce pet toothpaste to your regime. If you encounter a struggle, go back a step until the pet feels more comfortable. The last thing to master is the introduction of a soft tooth brush. Don’t completely abandon the pantyhose, however, because fingers fit more comfortably in the far reaches of the mouth, especially if the pet is small. With time, tooth brushing can be easy and should be performed daily for maximal benefit.